Meta Title Length in 2016 & the ‘Big’ Question: DOES Size Matter? - Adster Creative Inc.
One of those simple, ‘dinosaur’ on page signals that STILL makes a difference in your SEO efforts. Over the years, some of the biggest questions surrounding meta titles have been length (ie: character count versus pixels), and formatting (colons, delimiters & beyond). I actually did a presentation on this a couple years back when we observed “Home page” meta titles getting switch-a-roo’d to “Brand: Rest of your stuff here” regardless of how you had them written. These days, however, how long is long enough – and how long is too long? If one were to dig a little deeper, you’d find that most trusted info hubs on the web will give you this same information, more or less. Google’s been doing this kind of stuff for a while, but my recent casual surfing has revealed more of these changes happening in increasingly significant ways, and with some major deviations to the generally accepted standards. Note the differences in mobile and desktop titles here. In mobile, Pro Plumbing is CRUSHING it with a monster 2 line, 79 character meta title. That is almost TWICE the length of Action Auger’s (39 chars), and around 15% ‘taller’ pixel wise (ie: clickable area). Looking beyond this, it also has supplemental words that tie nicely into my query such as Furnace, Gas Line & Heating. If I was looking for a plumber that specializes in Gas lines, Furnace, or Heating, the meta title has just become that much more relevant, right? Granted, in desktop, Action Auger’s meta title falls neatly into the allowed characters without truncation, but the question needs to be asked – are they missing out on mobile opportunity? Finally, note that the “Brand: Rest of title” is not being forced by Google here and Pro Plumbing ‘benefits’ from an old school, keyword predicated left to right title. Here, we see the same desktop/mobile phenomenon where, once again, local SEO consultant Andy Kuiper enjoys a full two line meta title in mobile that not only includes the short form ‘SEO’, but the full ‘Search Engine Optimization’ on line 2 to boot. This is all newly developing stuff, and the best spot I’ve found that dives in was written over at Hobo Internet Marketing. Worth a read, if you have time. Big Ads Theory – In Google Adwords, we do all we can to increase the size of the ad – sitelinks, callouts and beyond. 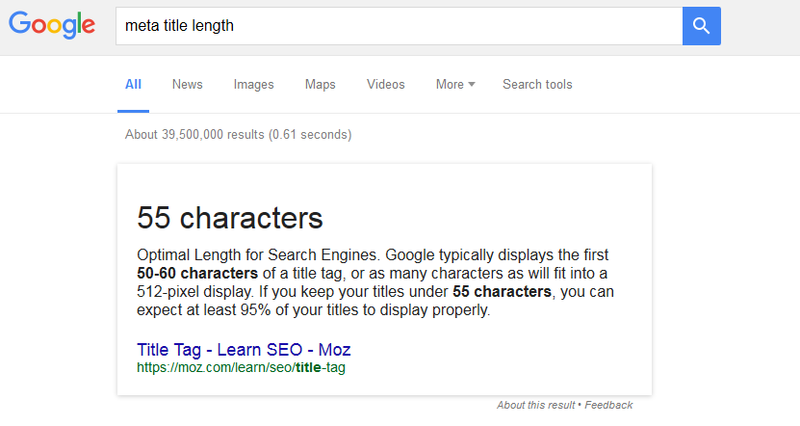 Is Google somehow ‘rewarding’ sites that make use of all available (whatever that limit may be) characters? Convenience – On a mobile device, a larger snippet is easier to click. Is Google looking to provide larger search results on mobile to make results easier to click? Relevance – one of the most probable theories, is Google willing to let your extra long Meta title roll if it is hyper relevant to a user’s query? We’ve just begun playing with this idea, and have benchmarked some of our clients current positions for select keywords and positions in mobile & desktop. I’ll update this post (or just write a new one) once we’ve got some answers. In the meantime, we’d love to hear your experiences here in the comments.